From cleaners and polishes to scratch removers and interior care protectants, the new GS27 catalog showcases 40 pages of premium car care products recently introduced to the North American marketplace. The catalog highlights the unique GS27 Titanium® technology products, including Self-Shining Shampoo, Gel Wheel Cleaner and Scratch Remover. Also featured is a line of polishes and repair products; tar and resin stain removers; and a wide assortment of air fresheners. Cleaning and care information for motorcycles is also included in the comprehensive catalog. A good service always starts with a complete clean of the vehicle. Put a dab of the product on a microfiber cloth. Rub with more or less intensity depending on the size of the scratch. Start again until you obtain the desired result. 1/ Insert the adapter stem into the drill chuck. 2/ Fix the foam pad to the adapter. 3/ Apply a small heap of Dual-purpose Restorer GS27® Technics on the scratch. 4/ With the drill stopped, spread the product on the surface with the foam pad. 5/ Start the drill. Proceed in large circular figure of 8 movements. Do not apply pressure to the bodywork. Check regularly that the bodywork is not heating up. If the bodywork heats up, stop immediately. This operation should not exceed 30 seconds. If your drill has several speeds, start with the slowest and increase the speed progressively but do not exceed 1600 rpm. 6/ Wipe off excess with the microfiber. 7/ Repeat the operation if necessary. 8/ For the best possible result, we recommend applying the High Protection Polish Titanium+® GS27 Classics® afterwards to protect the area treated. Do this on a clean and dry bodywork. Identify the type of scratch before application. In most cases this product will react effectively. However, if the scratch is deep (peeling paint, visible metal sheet or priming coat), consider a bodywork repair. To improve the protection of your bodywork after repair, we advise you to polish the vehicle with a GS27® polish. Shake the bottle well before use. Apply the product with a microfiber cloth in small circular movements (doors, wing mirrors, half bonnet, etc.). Dry immediately with a clean microfiber to obtain the shine. Start again depending on the state of oxidisation until you obtain the desired result. Do this in the shade and on a clean and dry bodywork. Do not use this product on porous or unpainted plastic. If there are white marks on the plastic, clean the surface with the GS27 Classics® Plastic Cleaner. To improve the protection and shine of your bodywork after repair, we advise you to polish the vehicle with a GS27® polish. 1/ Carefully protect the bodywork round the headlamp with masking tape. 2/ Insert the adapter stem into the drill chuck. 3/ Fix a sanding disc on the adapter. 4/ Wet the headlamp with a sponge and then dampen the surface of the abrasive. There should always be water on the headlamp. Add water during sanding if necessary. 5/ Start the drill and sand the headlamp. Proceed in large circular figure of 8 movements. Do not apply pressure to the headlamp. Check regularly that the headlamp is not heating up. If the headlamp heats up, stop immediately. Sanding should not exceed 1 minute per headlamp. Use one sanding disc per headlamp. 6/ Wipe the headlamp with the microfiber. 7/ Remove the sanding disc from the adapter. 8/ Fix the foam pad to the adapter. 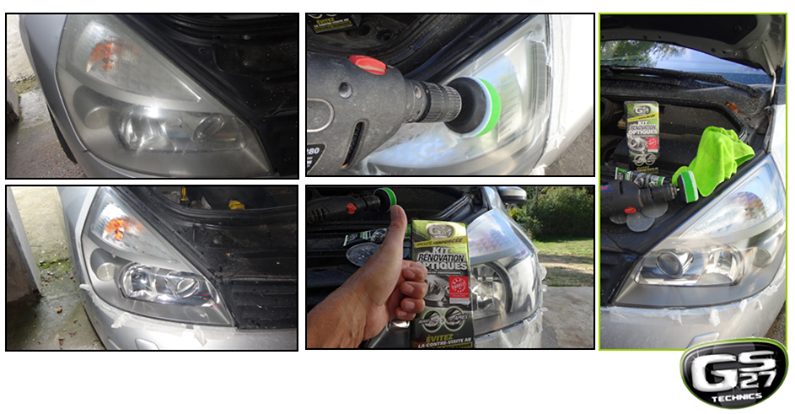 9/ Apply a few small heaps of Dual-purpose Restorer GS27® Technics to the headlamp. 10/ With the drill stopped, spread the product over the whole surface of the headlamp with the sponge. The headlamp surface should be completely covered with a fine film of product. Add product if necessary. 11/ Start the drill. Proceed in large circular figure of 8 movements. Check regularly that the headlamp is not heating up. If the headlamp heats up, stop immediately. This operation should not exceed 1 minute per headlamp. 12/ Wipe the headlamp with the microfiber. 13/ If sanding marks remain, repeat the polishing stage (start again from step 9). 14/ If the headlamp is not completely restored, repeat the operation until you obtain the desired result (repeat from step 3). Think about repairing other parts of your vehicle that have lost their original colour and brightness such as the bumper, chrome and tyres. Depending on the area to repair, choose the appropriate product and start the repair (on a clean and dry surface). Check the label for more information on the use of each product. Remove the most significant dirty marks using a high pressure cleaner (mud, dust, leaves, etc.). Dilute GS27 Titanium Shampoo in warm water. Clean the bodywork with a sponge from top (roof) to bottom (bottom of the body and wheel arch). Rinse thoroughly in clean water. On cold bodywork, spray the product directly on the dirty surfaces. Dry immediately with a microfiber cloth. Do small areas at a time. It is preferable to wash your vehicle in the shade and away from the wind. Avoid leaving your car to dry in bright sunshine, this risks leaving marks (especially if the water contains lime scale). If possible, dry the bodywork with a leather cloth for a shiny finish without marks. Spray the GS27 Titanium Wheel Cleaner or the GS27 Wheel Cleaner Acid Free directly on the wheel. Leave it to work for a few seconds. Rinse in water, preferably with a high-pressure cleaner or dry the wheel with a microfiber for waterless cleaning products. If the wheels are very dirty, repeat if necessary. Clean the wheels one by one. If the wheels are particularly dirty you can clean them using a brush. In some cases, you need to have specific products to remove certain stains that are particularly stubborn, like resin or tar stains. Spray the product directly on the stain. Leave it to work for a few seconds and rub with a microfiber cloth. Check the label for more information on the use of each product. Remove the stains one by one. We advise you to clean the entire vehicle to avoid “cleaning stains”. Do not wait to clean stains: the older they are the more ingrained they become and are thus difficult to remove. GS27 USA is celebrating summer! Free DéoCar Star Monoi on orders of $35 or more! DéoCar AirFreshners by GS27 USA, Inc. Guess what just arrived to the US? Our AirFreshners! You are tired of the old boring air freshener hanging from the rear view mirror? You are in for a treat then, because our GS27 DéoCar are now available on our website. Cherry, Lotus Flower, Monoi, Vanilla & Spices, Cinnamon & Blackberry… They are now available to make your car smell better than ever! It’s this time of the year when it gets dark earlier, more rainy days, and (brace yourself) snow might be coming to your area too! It is important that your car is safe and reliable, and there is maybe one part of your vehicle that you haven’t checked yet: your headlamps! If you car is getting older, you probably should be aware that your headlamps slowly but surely are prone to discoloration. The good news is, thanks to GS27 USA products, for only $24.95 you can restore it yourself and it is pretty easy! Check out our pictures, and the link for more information about our GS27 Headlamp Restorer Kit. GS27 Scratch Remover Is Officially Back! 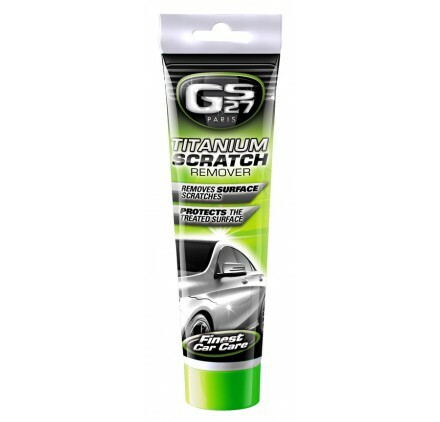 GS27 Classics® Titanium® Scratch Remover is a cream containing micro-beads and microscopic lamellar crystals, ideal for all surface scratches (scrapes, scratches, etc.). Its Titanium®-enriched formula improves the efficiency, strengthens the protection of the areas treated and guarantees a shiny finish. Its active ingredient erases the incisive edges of the scratch. Its smooth micro particles polish the edges of the scratch to reduce the angle of light reflection and erase the incision. Thanks for your loyalty in 2016!